Released via their own record label, Sister Polygon – which has, thus far, jolted the music world with early releases by Downtown Boys, Snail Mail and Sneaks – Priest’s second album is in equal measures brave and uneasy; a question and an answer. Now into their eighth year as a band, the Washington D.C. group remain an inspired aberration in contemporary music, blending their own brand of off-beat, wacky pop with bold lyricism that cuts to the quick. 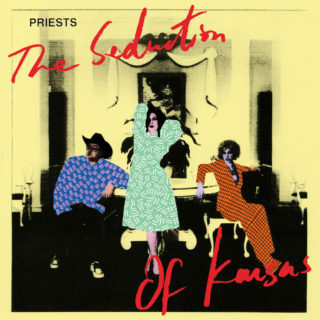 ‘The Seduction of Kansas’ sees for the first time Priests opening up their creative musical process to external collaborators. Unsurprisingly, then, this album, aided in its conception by the instrumental and song-writing flair of multi-instrumentalist Janel Leppin and bassist Alexandra Tyson, marks a watershed in the band’s musicality. Implementing fresh instrumental textures, and inspired by works – both aggressive and introspective – by the likes of Massive Attack, Nine Inch Nails and Portishead, ‘The Seduction of Kansas’ questions the realities and mythologies of contemporary America, without conceding to simple answers. The album’s title track is perhaps Priests’ purest pop song to date, and is certainly the zenith of the record. Doing exactly what the band do best – and manage to keep up throughout the entirety of the album – it concurrently stirs the emotion and inspires contemplation. Complex, questioning and thought-provoking, ‘The Seduction of Kansas’ provides a soundtrack for the modern age, pulled between persistent anxiety and the desire to just forget about it all and dance.